Blog post from a dear customer about my art. What a gift! Just in time for our move from the UAE (yup, we’ve touched down in Perth! ), I found an artist whose work really appealed to me: the colors, the style, and the subjects – everything just worked, you know what I mean? I follow a Dubai-based online marketplace called Little Majlis on Instagram, and they posted a photo of one of Amira Rahim‘s pieces from her shop within their marketplace – I went to her Little Majlis “shopfront” and adored her other pieces! 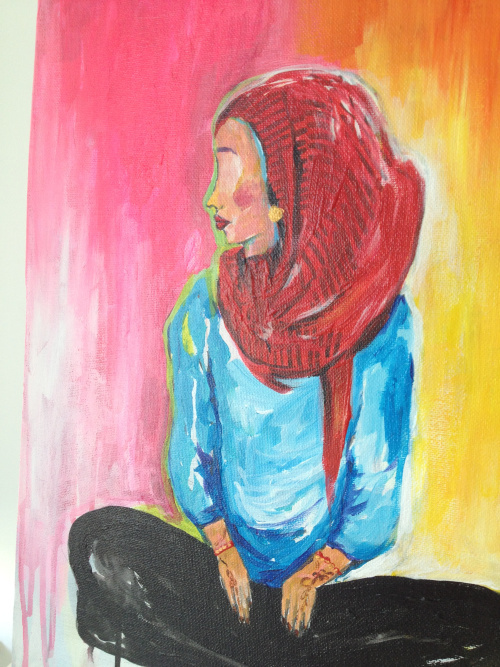 In particular she had a wonderful painting entitled Hajib Figure Study, and as soon as I saw it, I knew that I wanted it for our home.